A Saudi Arabian youth organization posted an image in its Twitter feed depicting a plane approaching the CN Tower (the tallest building in the world erected in Toronto, and the city’s symbol, whose height is 553.33 meters), which is reminiscent of the 9/11 terror attacks on New York. The Canadian website CBC, which reported on this story in a somewhat uncomprehending manner, remarked that these consequences most likely stem from the scandal between the governments of Saudi Arabia and Canada. The day before, Riyadh declared the Canadian ambassador to the Kingdom a persona non grata. In addition, Saudi Arabia severed all financial and trade agreements with Ottawa. It is common knowledge that young people everywhere are always the most aggressive, radical, brave and proactive. They refuse to accept authority or boundaries. At first glance, the direct threat of terrorism against Canada does not seem worthy of attention, after all, many threats appear every day. Washington is an apt example of this, because, every day, it issues a series of threats against different countries and for varied reasons. The US threats against Iran and Russia have truly gone into overdrive. But everyone has grown accustomed to these threats, they are no longer news. Saudi Arabia is another story altogether. Social media networks in the Kingdom are completely controlled, and many Saudis who express views that are even slightly different to the official ones can face prosecution. And the post in question actually depicted a future act of terrorism. What is going on here? The answer lies in the fact that Saudi rulers, most probably the young Crown Prince Mohammad Bin Salman Al Saud, who took over the reins of the Kingdom and its internal and foreign policies because of his father’s frail age and illnesses, have decided to raise their own stature and that of their country in the eyes of others. It started with Saudi’s active involvement in Syrian affairs on the side of terrorists. These actions were justified by the fact that their Arabic brothers were embroiled in a fight against an usurper, the Syrian President Bashar al-Assad. The fact that Assad became President via legitimate elections did not worry the newly-crowned successor to the throne. But with the aid from the Russian Aerospace Forces and Iranian volunteers, the newly minted Muslim “crusaders”, or terrorists, bandits, social outcasts, fighting for Saudi money, were defeated and kicked out of Syria. The sham intervention in Yemen’s civil war then followed. Having realized that Saudi “eagles” were not competent fighters, the Saudi Crown Prince limited his country’s involvement in this war to air raids against defenseless cities, towns and villages, which resulted in much suffering, primarily, among the civilian population. At the same time, Saudi Arabia, engaged in its unlawful invasion operation in Yemen in defiance of international law, is actively hiring mercenaries from the criminal organization Al-Qaeda in the Arabian Peninsula who are to oppose one side of the conflict, the Houthis. Al Jazeera published a report, based on research conducted by the Associated Press journalists, on this, which contradicts Riyadh’s statements that the Kingdom, purportedly, dismantled this network. The authors of the report claimed that a deal between the militants and the Saudis allowed the former to leave the previously conquered settlements with their arms and loot unimpeded. According to a US public servant, who wished to remain anonymous, Americans are aware that the ranks of several Sunni units, fighting against the Houthis from the Ansar Allah movement, contain former militants from Al-Qaeda (banned in Russia), including field commanders, who received money from the Saudis and were put on a list of terrorists connected to Al-Qaeda by the US. A similar article was published by the New York Times. There has been news that the Royal Saudi Air Force struck a school bus in the Yemeni Saada Governorate with a missile. At least 43 people died, and dozens injured as a result. Johannes Bruwer, the Head of the Delegation of the International Committee of the Red Cross to Yemen, posted on Twitter that most of the victims were children under 10 years of age. Medical workers have claimed that more than 60 people have been injured. The channel “Al Jazeera” quoted Hakim Almasmari, the Publisher and Editor in Chief of the Yemen Post, as saying that the air force struck the bus when it had entered a market square, and pilots had had a clear view of the bus under attack. What happened to lamentations by the Western press about this mass murder of children? Is it possible that they notice only things that benefit them or that they get paid well for, including Saudi money? Failure to achieve success in these two missions prompted the Saudi Crown Prince to follow in the footsteps of his overlord, the US, and attempt to reign in its small neighbor, Qatar, by imposing inhumane sanctions in contravention to international law. Simultaneously dozens of accusations were levelled against Qatar for its involvement in affairs that Saudi Arabia had a hand in. For instance, one of the key accusations put forward against Qatar had to do with its active support of terrorists in Syria and Yemen, and its involvement in UAE’s internal affairs. Besides, Saudis do not like the Arabic media outlet Al Jazeera that broadcasts, among other things, truthful information about the Kingdom. 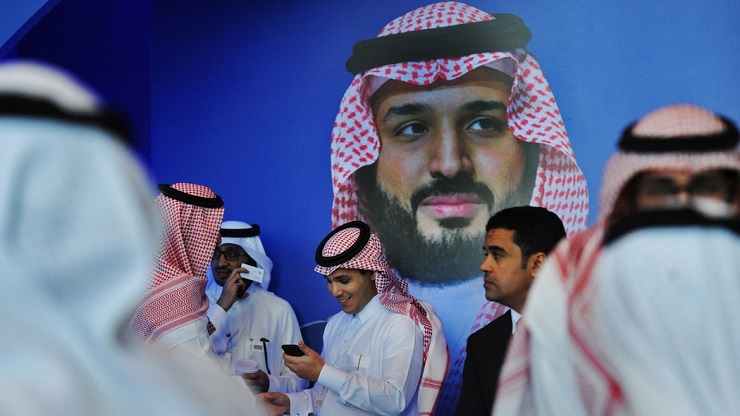 The Saudi demand to shut down this news organization met with sharp protests from many, including journalists working for international media outlets, as this demand directly violated the human right to free speech and access to information. But still, Doha’s yielding to this demand, as well as others, would have signaled Qatar’s complete capitulation in the face of Saudi aggression. It would have meant Mohammad Bin Salman Al Saud taking over the reins of power in Qatar, which was unacceptable to its rulers. The Prince has not had much luck with stoking hysteria against Iran either. It is fairly normal that Riyadh wishes to dominate not only the Arab world but quite possibly, from the natural resource perspective, the Persian Gulf region too. But, from the viewpoint of the young Saudi ruler, Iranians stand in his way. And instead of joining forces and controlling the region, its rich oil deposits and the Arab world, together, the inexperienced Crown Prince decided on the path of confrontation by choosing famous Shell game players in the region, such as the USA and Israel, as his allies. It is worth reminding the readers that the Arabic world does not recognize Israel as a legitimate state and refers to it as the Zionist enclave. However, even in this case, the Saudi Crown Prince was unsuccessful, with only a transfer of a large sum of money to the US in exchange for outdated weapons, which the Saudi Army does not need, working in his favor. Since the Crown Prince did not see a way out of the situation, which he had created in the first place, the ruler chose to go along with the idea of showing his power and might to Canada, located several thousand miles away from his Kingdom. This is what actually transpired: Canada’s Minister of Foreign Affairs, Chrystia Freeland, made a statement that expressed extreme concern about the plight of the Saudi Arabian human rights activist, Samar Badawi (the blogger’s, Raif Badawi, sister), who was arrested, and appealed for both of them to be released. Statements by Canadian diplomats were followed by a recall of the Saudi ambassador from Ottawa by the Kingdom’s Ministry of Foreign Affairs, and by the declaration that the Canadian ambassador to Riyadh was a persona non grata there, giving him 24 hours to leave the country. In addition, Saudi Arabia announced that it would suspend all new trade and investment ties with Canada, and their joint education programs, aimed at sending Saudi students to this Western nation. The creator of the website Free Saudi Liberals, Raif Badawi, was arrested in 2012 for criticizing the Kingdom’s religious police and spiritual leaders, and was also accused of insulting Islam and committing cybercrime. He is currently serving a 10-year jail sentence, while his wife and three children remain in Canada. The head of the Saudi Arabian Ministry of Foreign Affairs stated that the detained individuals were not human rights activists and instead represent interests of other nations. He also confirmed that they would be officially charged soon. Many countries of the world officially and publicly criticize Saudi Arabian policies that suppress basic freedoms and curb its citizens’ rights to express themselves. Riyadh responds to all of this criticism fairly weakly according to the proverb “The dogs bark, but the Saudi caravan goes on.” And only now the Saudi Crown Prince became actively involved in the Canadian–Saudi relations by attempting to, as the saying goes, to fish in troubled waters, and restore his faltering authority and reputation. Incidentally, Washington’s stance of keeping quiet in this situation is fairy appealing. On one hand, the US ought to support Ottawa, its nearest neighbor and ally, in its struggle against Saudi Arabia for human rights, democracy and free speech. On the other hand, who else would then opt to purchase US long-kept weaponry for hundreds of billions of dollars, and help Donald Trump in his tireless struggle to improve the US economy and reduce national debt. This is where Scylla and Charybdis lie, and careful maneuvering is required to pass between them. And simple phrases along the lines of “We think that Moscow was responsible for interfering in US elections, which led to the win by a candidate favored by Russia”; “Russia was behind the Salisbury nerve agent attack ”, and “Moscow is the sole culprit for the imbalance of power in the Persian Gulf region and the entire Middle East” have stopped serving their purpose. And now we will be able to examine the level of professionalism (if it exists) among American diplomats and politicians.